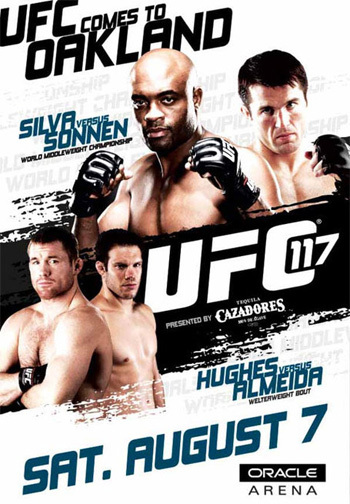 With the addition of the pivotal welterweight match-up between Jon Fitch and Thiago Alves, the dance card for “UFC 117: Silva vs. Sonnen” on August 7th is now fully booked. The pay-per-view broadcast will be jumping off inside Oracle Arena in Oakland, California. Controversial middleweight champ Anderson Silva will defend his strap against Chael Sonnen, the man who is spearheading “The Spider is Junk” campaign. The bitter rivals will throw down in OakTown to determine who the planet’s top 185-pounder is. When challenged, the Brazilian has displayed a vicious arsenal that’s sent most into unconsciousness. Unfortunately, fans haven’t witnessed MMA’s deadliest assassin do his thang in quite some time. Sonnen has promised that a new king will be crowned if the vintage Silva doesn’t return.